One of the harder materials on Sornieth, these scales are worked into a fine point to be used in arrows or small throwing weapons. 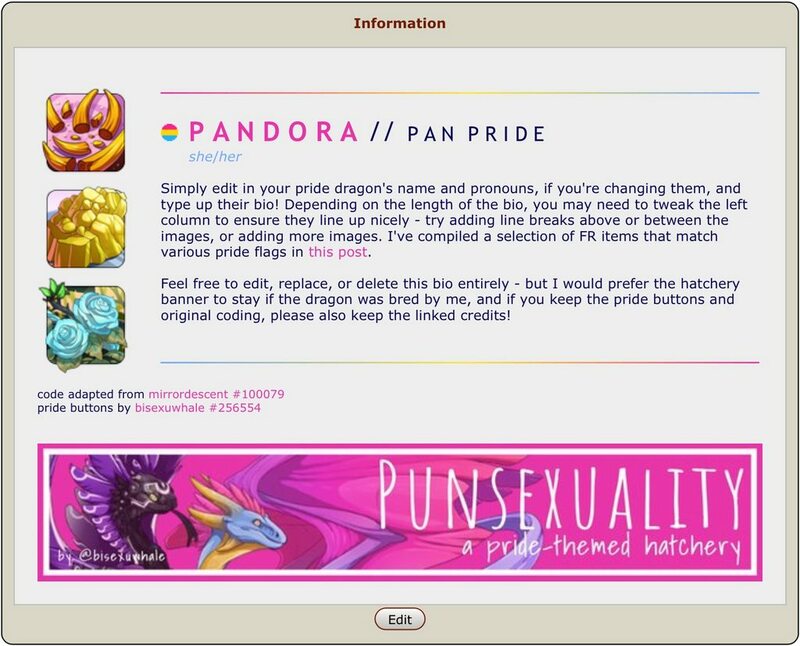 Pride-themed doodads, coding and inspiration for your forum posts, dragon bios, clan profile and signature. Image heavy in the third post, sorry about that. And please let me know if you've used anything! I'd love to see. Unlike their crystalline cousins, Nebula Floaters are oddly sweet. They may also cause fang decay. You could have sworn you saw a few of these running around Baldwin's cauldron the other day. Probably maybe fine to eat. This deep blue mineral is most often used as pigment due to its tendency to convert into malachite should it encounter too much heat. When not being harvested for crafts, they are admired for their large and beautiful crystal formations. - - -It's some tiny pride buttons! These buttons are just 15x15 pixels. 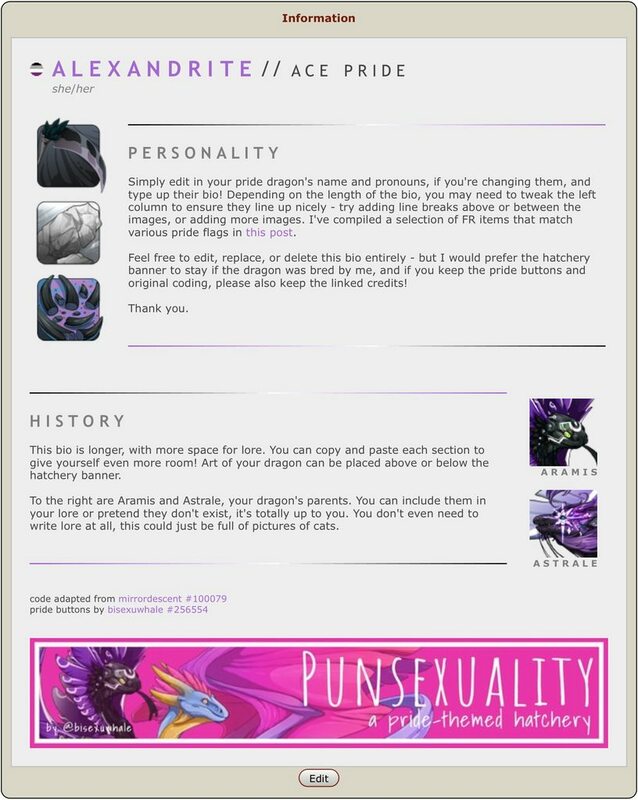 They fit perfectly alongside size 6 text (as above) in forum posts, dragon bios, clan profiles and signatures, and are featured in my pride dragon bio layouts in the fourth post down. If you don't see your identity but want a little button, don't hesitate to ask! They don't take long to make (as I'm just filling in 15x15 pixels in the right colours) and I'm happy to help. In Arcane flight, we have an LGBT+ hub with an axolotl mascot. This has of course led to me having the idea of recolouring the leucistic axolotl food item in pride flag colours. So far I only have a few flags, but I plan on doing more (feel free to critique, by the way, I've never recoloured items before and I have no idea what I'm doing, I use a different technique for every one). the original coding was by mirrordescent, heavily edited by me, and tiny buttons by me too. also they're written as if u just bought the dragon from my hatchery, it's cool to use them on other dragons, just delete the banner from the bottom! The short bio templates all follow this layout, but with different colour schemes. Long bios follow this format with different colour schemes. This Iridescent Rainbowlotl is really pretty. I'd like to use it in a bio for my dragon who collects pretty/shiny things. I also think a micro deer would be cool in rainbow. In fact, I have a rainbow accent for Imperial (Toxicity) in case my accent, Electroheart for Pearlcatcher doesn't work. @AngelOfMetal Aahh you're right but I think I want to stick to the axolotls and do a big variety of pride flags so there's something for everyone! As well as the fact that they're relevant to the arcane LGBT+ hub members. They're very pretty. I'm not Arcane so I don't quite understand the relevance, but if you decide to stick to acelotls, maybe I'll do micro deer for the Fire Flight, and make rainbow ones, sparkly ones, and other cool looking ones...Also love the idea of a rainbow vomiting acelotl. @AngelOfMetal That would be awesome and I'd love to see them!